Your contributions come out of your gross income – that’s called converting salary entitlements into pension entitlements, meaning you are not paying any taxes on your contributions today, and the income that you have to tax decreases – and thus your taxes also decrease. That’s because the taxes are only calculated after your contribution is deducted from your income. Your contributions are also exempt from social security contributions up to a limit of 4 % of CAC. Therefore, you pay much less net than what flows gross into your pension! Just how high your tax advantage is depends on your personal situation: income, tax bracket, children etc. This is what you have to pay attention to! Taxes and contributions upon payout: Of course the state does not completely abandon its money: Regular taxes and social security contributions are incurred upon payout. But overall it is worth it: As a rule, your tax rate in retirement is below that of your working life. And your social security contributions as a rule are in total also lower: Your contributions to unemployment and state pension insurance stop. Health and long-term-care insurance, however, are to be paid at their full amount (employer and employee share). Impacts on the state pension: You save the social security contributions today for contributions up to 4 % of CAC,. But that also means: Fewer contributions will flow into the state pension fund and your state pension claims will decline. 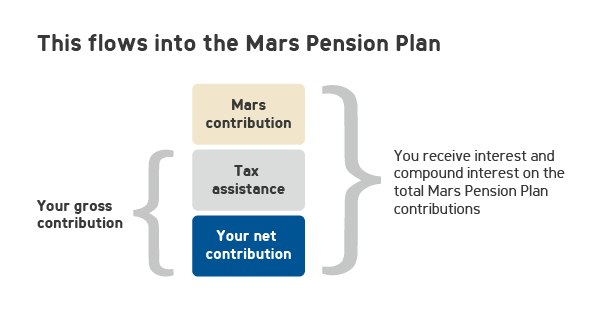 But this will be more than offset by Mars contributions that you receive through your investment and their performance!